No suprise here. America’s wealth still belongs to rich white men. Washington resident and Microsoft founder Bill Gates’ $80 billion net worth makes him the richest person in the country (and the world). The least rich individual on the map is Robert Gillam, founder of McKinley Capital, an Alaska-based institutional investment firm. But don’t feel too bad for him — he’s worth a cool $700 million. Heirs to the Walmart empire dominate three states: Arkansas (Jim Walton, worth $35.7 billion), Texas (Alice Walton, worth $35.3 billion) and Wyoming (Christy Walton, worth $37.9 billion). Here’s to so-called upward mobility. 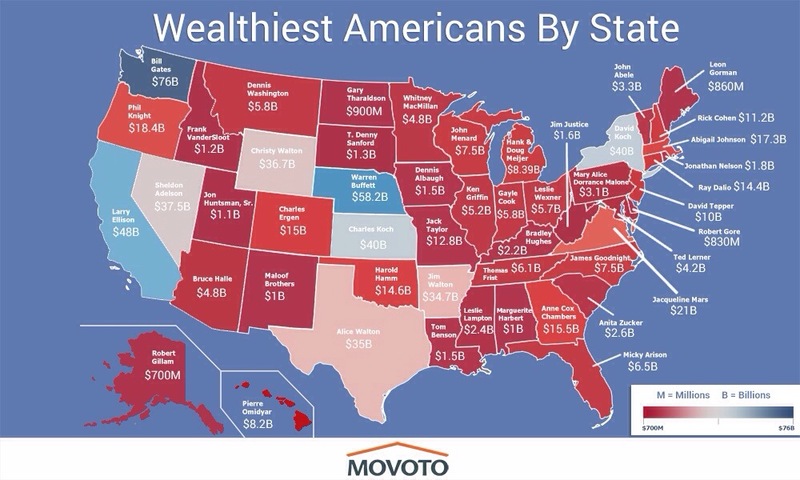 Movoto used wealth data from Forbes and Celebrity Net Worth to create the map.